Description: CN #5701 and BCOL #4642 sit on the Canadian side of the International Bridge in Fort Erie, ON. Description: An empty grain train coming off the north end of Arcola siding. Description: BC Rail C44-9W 4642 on the head end of a north bound grain empty. Description: A grain empty heads north out of Arcola siding at Fluker, LA. Description: The classification for this locomotive should be C44-9WL. Title: CN 2706 & BC 4642 head east through Ardrossan at MP 250 of CN's Wainwright Sub. Title: Lookie what we have here!! Description: Hollow Road, 0648 hours. Description: A still frame from the video i took, sorry about the bad quality! Description: IC 6100 sits on dummy trucks outside the shops along with two others. Description: Rounding the bend at Bethesda Road. Description: Kicking up some dust on Bethesda Road. 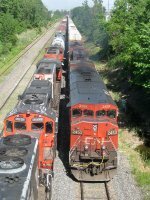 Description: Passing a CN transfer with 4 geeps: CN 9584, CN 7031, CN 4724 & CN 9524. Description: IC 6204 shoves down the west wye as it sets out the MNNRs before heading down to the CP and BN. Quite the leader to say the least!